We are pleased to announce the release of our YQA Super Tench general materials carrying wagons expansion for Train Simulator on Steam Marketplace. 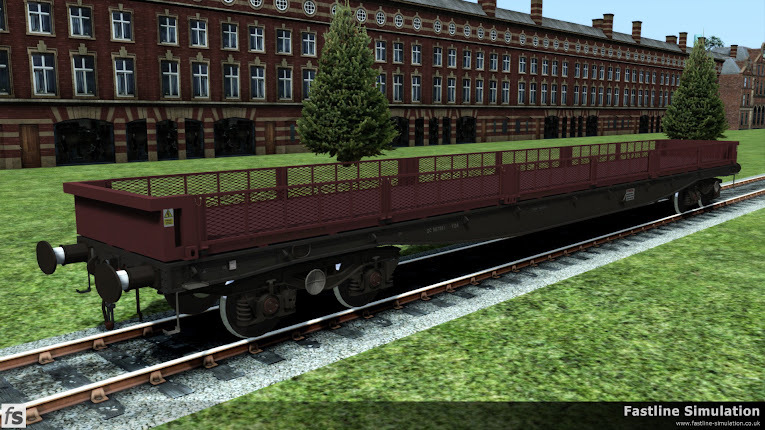 This expansion continues the story of the airbrake converted BRV BORAIL wagons featuring the conversion to general materials carriers by fitting mesh sided modules in place of the existing bodywork. The BORAIL wagons were an interesting group that found themselves built in the revenue series of wagons although they would find themselves often used as special wagons and for the Civil Engineer. The primary use for the wagons was the transportation of lengths of new rail from the rolling mills to either track prefabrication plants or to docks for export. Given that the standard length of rail was 60ft the BORAIL wagons measured 62ft over headstocks and were fitted with bolsters to support the load. There were two variations of BORAIL constructed with different types of traffic in mind. By far the largest group were those 135 built to dia. 1/483 with 5 bolsters for the carrying of finished rail for fabrication or export. A further 30 wagons were constructed using the same under-frame but without the bolsters. These wagons were designed for carrying pre-stressed concrete beams and had flush sockets on the deck to locate stanchions as required. Although designed with two specific traffic uses in mind, photographs show that they were looked on as ‘handy’ for a number of other uses including carrying vehicles. Naturally they were pressed into service to carry items longer than other bolster wagons could handle without the need for runner wagons. However, they also seem to have found a lot of use in carrying exceptional loads either as spacers or for carrying the load itself. In some pictures the bolster fitted wagons can be seen with their bolsters removed to carry alternative loads including deck sections for the Humber Bridge. The 1970’s and 1980’s saw a large program to convert existing wagons to the air braking system as British Rail attempted to modernise and increase the speed and profitability of its freight services. The vast majority of the BORAILS (150 out of 165 constructed) passed through the BR works in Shildon for air brake conversion that was to radically change the appearance of the wagons. The bogies were replaced with 1.8m wheelbase Y25C bogies fitted with hand brake wheels. Alongside this the body was totally rebuilt with new 8-inch high sides with six (later 8) pockets for ratchet tensioners to allow the use of nylon straps for securing loads, a new deck was fitted along with six new bolsters. The mounts for the original securing rings were retained and used to support the new body and the wagons were finished in Railfreight flame red and grey livery. However, the membership of the revenue fleet was to be short lived as in early 1983 the entire fleet was transferred to the Civil Engineers department where they gained the TOPS code YLA and FISHKIND of ‘Mullet’, generally stencilled on a central yellow panel along with a DC prefix to the number. Eventually the wagons gained the engineers yellow and grey livery. Many of the wagons gained additional ratchet tensioners both to increase those originally fitted with 6 tensioners per side to 8 or in some quite random locations possibly related to a specific load at some point. In about 1985 around 10 wagons were converted by the Southern Region for the carrying of track panels by removing the bolsters and fitting heavy longitudinal timbers to raise the load above the deck rails. Initially the wagons gained the TOPS codes of YMA but retained their fishkind of Mullet. However, (possibly due to confusion) they gradually started gaining the fishkind of Parr. At this point the story becomes a little uncertain as these initial conversions then appear carrying concrete sleepers complete with the TOPS code of YQA but still retaining their original bodywork often with an additional tensioner at the mid-point if this had not been fitted at the point of the earlier conversion to air brakes. At around the same a time a larger number of YLA Mullets were converted specifically for carrying concrete sleepers. These also lost their bolsters in favour of the longitudinal timbers but topped off with thinner timber strips. At the same time the bodywork was modified to include a step at the outer ends on both sides. Other conversions involved the fitting of more tensioners to number 13 per side along with the steps at the end to a slightly different style. Ultimately there were some 69 conversions for sleeper carrying and they all ended up carrying the TOPS code of YQA and fishkind of Parr. As the maintenance fleets were updated and developed following privatisation, a number of new ideas and designs began to appear. One of these was the more versatile use of infrastructure rolling stock using modules that could be easily changed using ISO container fixings and a number of container wagons were purchased for this kind of use along with existing container flats being transferred. In a slightly odd turn of events, a number of YQA Parr and YLA Mullet wagons have had their bodywork removed and three part Super Tench modules with open mesh sides and six doors per side fitted (even though the wagons do not have ISO container fittings) as general material carriers. The units themselves are formed in three parts with two identical outer modules complete with end sections and an inner module which fills the gap with additional floor and a pair of mesh doors. The wagons are used to carry small amounts of new materials to work sites and waste materials from sites in a manner similar to a skip at times. Quite often photographs show one or two wagons formed as part of an engineers train but with no load at all so it may be safe to assume they are often included as a just in case measure should something need to be carried.